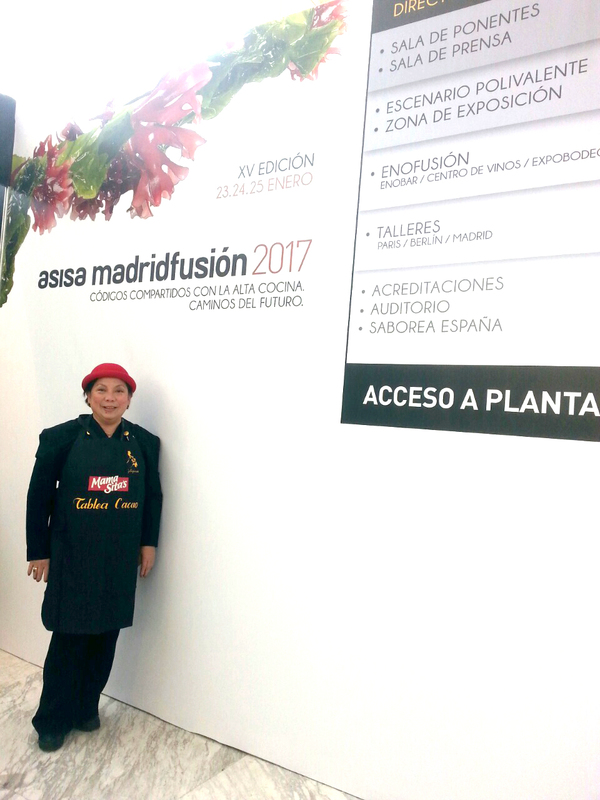 A few weeks before Madrid Fusion in Spain, Corrie Salandanan, who lives in Paris, received a call from Mama Sita’s in Manila, inviting her to represent the Filipino heritage brand in the prestigious food event in Madrid. Although she has lived in France since 1993, Corrie is born Filipino. Her heart skips a beat for a warm bowl of champorado with dilis. She worked with Mama Sita’s before in Paris, where the company was promoting their food-writing contest, Mga Kuwentong Pagkain. This is her first time to be sent out of town for Mama Sita’s—and what more, to a big event. Armed with her seasoned cooking skills and charming personality—plus an apron and rice cooker for Mama Sita’s Champorado—Corrie flew to Madrid from Paris to fulfill her Filipino mission: to ensure that Mama Sita’s dishes are cooked and served well at Madrid Fusion, as she would at home for her family. Corrie used to be a member of the Bayanihan Dance Company in 1969 and then later she joined the famous Aldeguer Dance Co in 1975. After moving to France, she started working as “Animatrice d’Anglais” with Relais Mini-schools, teaching English to children ages 3 to 11 years old in Versailles, Chaville & Sevres. She hustled several jobs from being the personal home cook of renowned French chef and restaurateur Christian Constant to being a product ambassador for home cooking wares. But of all the jobs, moonlighting for Kusina ni Mama Sita is closest to her heart, closest to her true home. 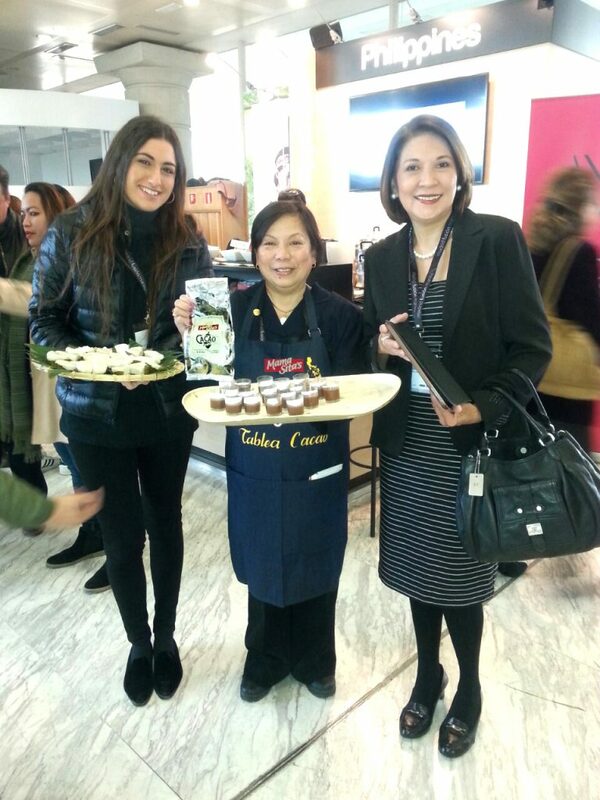 Today, she puts all her work experience to use promoting Mama Sita’s products to all foodie visitors in Madrid. She is serving the Filipino favorite champorado, not the usual one, but Mama Sita’s Heirloom Rice Champorado. Mama Sita’s uses heirloom rice sourced from the Cordilleras– Balatinaw and Ominio or deep purple rice, Kalinga Jekot (brown rice) and Minaangan (red rice). All these variants go well with the pure cacao tableas from Davao. The result is truly memorable dark chocolate heirloom rice champorado porridge– what both the Españols and Filipinos would enjoy immensely. After all, champorado has Hispanic origins with cacao being brought from the New World (Mexico) through the Galleon Trade in the 15th century. Meanwhile, our native heirloom rice is a product of Cordillera Rice Terraces, carved by our ancestors hundreds of years ago. Watch out for the different Mama Sita’s dishes that Corrie serves at the Philippine Pavilion of Madrid Fusion in Spain from January 23 to 25, 2017.